Artichokes are very common in Italian cuisine and used widely around the Mediterranean. In Britain they are still something of a mystery, but this versatile vegetable can be a perfect side dish or starter. First, check you have the right vegetable. 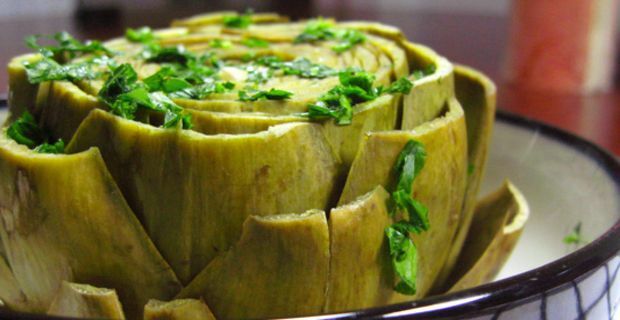 Globe artichokes are the Italian delicacy. Jerusalem artichokes are root vegetables, and completely unrelated. Look for artichokes that are tightly-closed, with firm heads and no brown patches. The trickiest part of serving up artichokes is preparing them. You need to slice them in half, discarding the stem and top. The tougher outer leaves must also be discarded, leaving only the white section, The hairy centre, known as the 'choke' can be scooped out with a spoon. You are left with the tender heart of the vegetable. Artichokes are best cooked gently, steamed or poached so that they retain some bite without being tough. The time will depend on the size and age of the artichokes, with the larger ones requiring around half an hour. Young artichokes can be served with a little butter or hollandaise sauce, rather like asparagus. Softened artichokes make an excellent pizza topping. Thinly sliced, they brown a little when the pizza is grilled and combine brilliantly with mozzarella. Fried with a little bacon or pancetta and finely-diced onion, they also make a tasty and simple sauce for pasta. Artichokes will discolour if left to stand too long before serving. Keep them in the cooking water, with a drop of lemon juice added, until you are ready to serve them.